Catherine Needham considers the components of the personalisation narrative that have enabled it to acquire such dominance in public policy. Her work reminds us of the power of emotion and anecdote in framing policy debates, centring most recently around welfare state reforms. Daniel Sage finds this study a welcome and persuasive critique of the policy-making process. 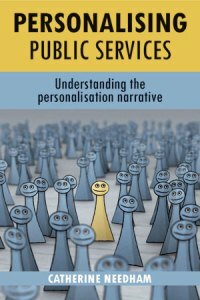 Personalising Public Services: Understanding the Personalisation Narrative. Catherine Needham. Policy Press. 216 pages. July 2011. Personalisation is one of the biggest buzzwords in public policy. Throughout an array of policy areas, such as social care, the NHS, education and welfare-to-work, political parties of left and right have strived to be the biggest advocates of personalised public services, in which users are given more control over the services they use. But where did this trend grow from? And how has it been framed and conceptualised in order to become the policy orthodoxy it is today? These are the questions posed by Catherine Needham, Senior Lecturer in public policy at Queen Mary, University of London, in this new study. At the centre of Needham’s argument is the idea that the personalisation of public services has been told and established as a ‘policy story’. Thus, as the personalisation narrative has taken hold in policy circles, the major determinant of its success has been the stories and tales told about reform, as opposed to the research, evidence and impact of the policies themselves. At the core of the personalisation story lie five identifiable and recurrent story lines used to ‘sell’ personalisation to the electorate: (1) personalisation works and makes people’s lives better; (2) it saves money and is more efficient than a ‘one-size-fits-all’ model; (3) person-centred services reflect the realities of people’s lives and not the ‘boxes’ the welfare state used to categorise people in; (4) personalisation applies to everyone, not just those in need, and can transform people’s relationships with the welfare state; and finally, (5) personalisation recognises that people are the experts on their own lives, and should not be dependent upon ‘professional expertise’. Taken together, these anecdotes have formed into a wider story, used to push the agenda of personalisation forward by its leading proponents. Needham discusses how the personalisation agenda is most clearly developed in the welfare state, and in adult social care especially. Over the past couple of decades, the focus on personalisation has manifested itself in a range of new developments, such as ‘person-centred planning’, ‘self-directed support’ and ‘direct payments’. By the mid-2000s, Needham argues that the outcome of all these developments was to produce a new policy orthodoxy in social care, in which personalisation was the de facto model of choice. To explain how this orthodoxy came to fruition, Needham looks to her theory of a policy story. The story that established the personalisation narrative in adult social care was crafted by a diverse range of actors. These included disability campaigners, policy entrepreneurs, and, perhaps more surprisingly, sympathisers within New Labour and the New Right who sought deep reform to public services. Part of the success of these actors in establishing the personalisation agenda as mainstream lay in crafting a narrative and rationale that stretched across ideologies and was diffused both from the bottom-up and the top-down. Needham writes that personalisation in social care acquired influence through its ability to cohere with a broader political climate of individual rights, public service reform and personal independence. These stories, based around a mix of formal data, individual testimonies and self-evidence, have propelled personalisation to the fore of policy-making, jumping ahead of more traditional sources of evidence such as formal policy evaluation. The same pattern can also be observed in the personalisation of welfare-to-work services. The call for a more personalised approach for jobseekers, characterised in a Policy Exchange report on Personalised Welfare: Rethinking employment support and Jobcentres, emphasises individual motivations, stories, and experiences as barriers to employment. Arguably more convincing evidence around the structural causes of unemployment, such as weak labour demand, takes a back seat. While Personalising Public Services will be of most interest to policy analysts and practitioners working within the realms of personalisation, the central argument offers an important lesson for all those interested in social policy. Namely, the case that reforms are framed, conceptualised and implemented as policy stories is engaging and convincing and can help make sense of how big changes are introduced throughout the welfare state. The intense and controversial reforms to welfare, education and healthcare can be much more effectively understood if we view how they have been crafted as emotionally loaded over-arching narratives, designed to convince us of the need for change. Needham’s policy narrative thesis is a welcome and persuasive critique of the manner in which policies are formed and implemented. For many years now, political parties have been keen to stress the centrality of evidence to policy-making, with reforms supposedly based around the mantra ‘what counts is what works’. However, Needham’s case study of personalisation delves more realistically into what the policy-making process genuinely consists of. It reminds us of the importance of narrative – and of the power of emotion and anecdote – in framing policy debates. This review was first published on the LSE British Politics and Policy blog on 26th February 2012. Daniel Sage is a PhD student at the University of Stirling. His PhD thesis explores how welfare-to-work reforms have affected the experiences and interactions of benefit claimants with the welfare system. Additionally, he has academic interests in income inequality and social cohesion, public attitudes towards the welfare state and the politics and philosophy of social policy. He has a BA in History from University College London and an MSc in Social Policy from the LSE. He tweets at @djsage86 and blogs at http://knowledge-is-porridge.blogspot.com. Read more reviews by Daniel.